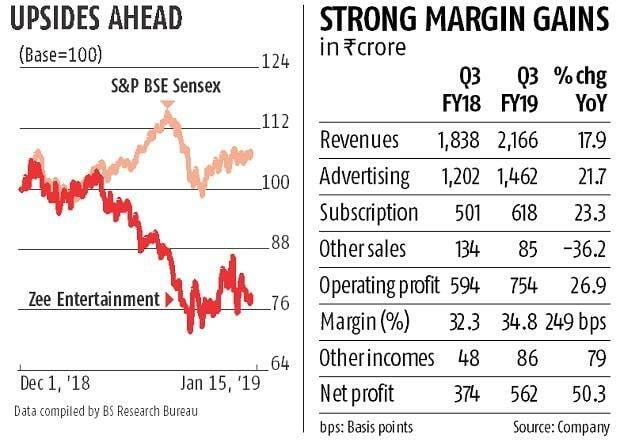 Led by strong advertising growth, Zee Entertainment Enterprises (ZEE) reported an 18 per cent jump in consolidated revenue for the quarter ended December 31, 2018 (Q3FY19). Consolidated revenues for the quarter were Rs 2,166.8 crore, up from Rs 1,838.1 crore in the same quarter last year. In addition to the healthy growth in advertising revenues, which were up 21.7 per cent, subscription revenues too registered strong growth of 23.3 per cent year on year. The advertisement segment accounts for over 67 per cent of overall revenues of the company. Within this, the domestic advertising revenues have witnessed consistent growth, led by viewership share gain on the whole as well as at the regional-level. This is the fifth quarter in a row that domestic advertising revenues have grown 20 per cent or more year on year. After being stagnant in the Rs 50-65-crore band, international revenues posted robust 40 per cent year-on-year growth in revenues, led by the recovery in the West Asian market as well as traction in Europe, the US and the Asia Pacific region. While the company did not quantify the growth, some of the gains in the advertising segment also came from its online application platform ZEE5. The company indicated that talks with strategic investors for a stake in the company were on, and the management was hopeful that a deal would be finalised by April. The company indicated that it would continue to grow its advertising revenues faster than the industry, led by market share gains and advertising demand from across sectors. The sector is expected to grow its advertising revenues by about 14 per cent, largely led by higher spends of consumer companies, with Zee outperforming because of network leadership. The other key revenue contributor is the subscription revenues, led by 28 per cent growth in domestic subscription revenues. The segment grew on the back of a low base, and monetisation of the Phase-III subscribers. The international subscription revenues were up a tad. On the expenditure front, higher investments in ZEE5, elevated movie amortisation costs, marketing and other expenses were responsible for the cost uptick. However, despite the cost pressures, the company's profit before taxes, interest, depreciation and amortisation was up nearly 27 per cent. Margins in the quarter, too, were up 250 basis points to 34.8 per cent. 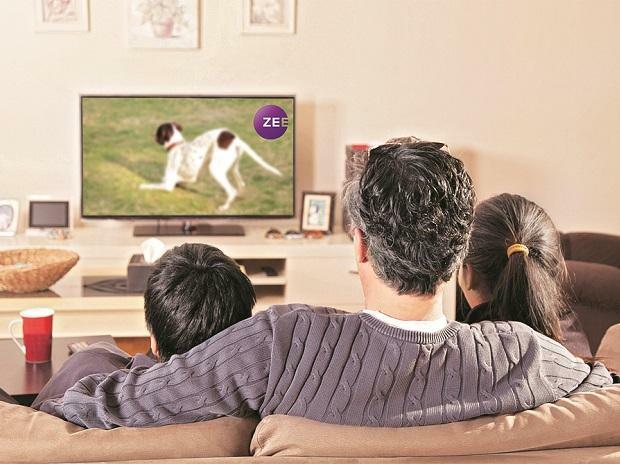 Though investments in original content are expected to increase in ZEE5, the company reiterated the margins at the consolidated level would continue to be over 30 per cent. While the strong margins and top line performance helped, net profit for the quarter, which was up 50 per cent to Rs 562 crore, was aided by higher one-time income on account of sale of licences and VAT refunds.